This research develops and implements a life cycle sustainability assessment (LCSA) framework to evaluate the environmental, economic and social performance of geotechnical solutions and guide innovation throughout the research and development process towards environmentally preferable and cost effective solutions. 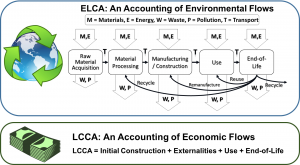 LCSA integrates environmental life cycle assessment (ELCA) and life cycle cost analysis (LCCA) to make analytical and informed decisions. The LCSA framework will provide the means to analyze and compare the environmental, economic, and social impacts of industry practices and emerging technologies (even at their earliest stages of research and development) in geotechnical engineering. The LCSA research team developed and disseminated a LCSA questionnaire to CBBG researchers, and having collected them we are now applying the LCSA framework to proposed research projects to provide feedback on analysis outcomes and recommendations for future directions.